The Fall season has brought about a gorgeous golden glow with the changing colors of the leaves and the cooler temperatures. This season marks the Halloween and Thanksgiving festivities, as well as the excitement that comes right before the Christmas holiday. Over at Fairyland, fairies, pixies, and gnomes are celebrating with a floral fairy garden in the colors of Fall. 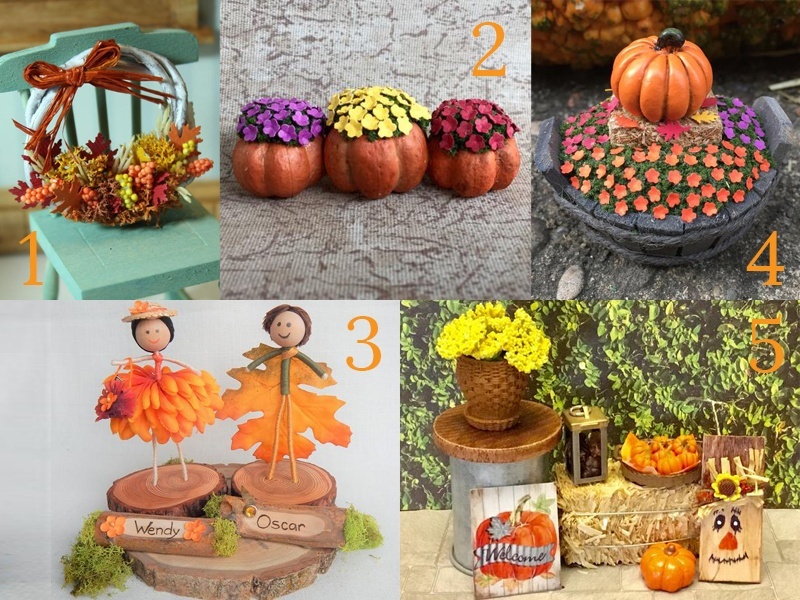 Let's check out the fun Fall fairy garden accessories to celebrate the season. This charming miniature wreath is just like a real life wreath with its gorgeous Fall colors of orange, gold, and brown. It is lovingly hand fashioned with a bounty of Fall harvest colors in an arrangement to celebrate the season. It measures 1.75 inches in diameter and is perfect for any fairy garden home. Check out these charming pumpkins from the pumpkin patch! Each one contains a beautiful bunch of tiny little mums in colors like purple, yellow, and burgundy. You can place this in a pathway in the fairy garden or right by the fairy house. Meet Wend the Wandflower Fairy and Oscar the Oak Fairy, the newest, cutest couple in the Royal Fairy Kingdom! This pair have traveled far just in time for the Fall celebrations. Wendy is always ready for any adventure, as she totes her bag and garden tools with Oscar. The pair are inseparable! This set comes with the two fairies, Wendy's purse and tools, Wendy and Oscar's nameplates, and a pair of bases. Look at that beautiful basket case of golden flowers! This Fall set features a delightful collection of miniatures for your fairy garden. 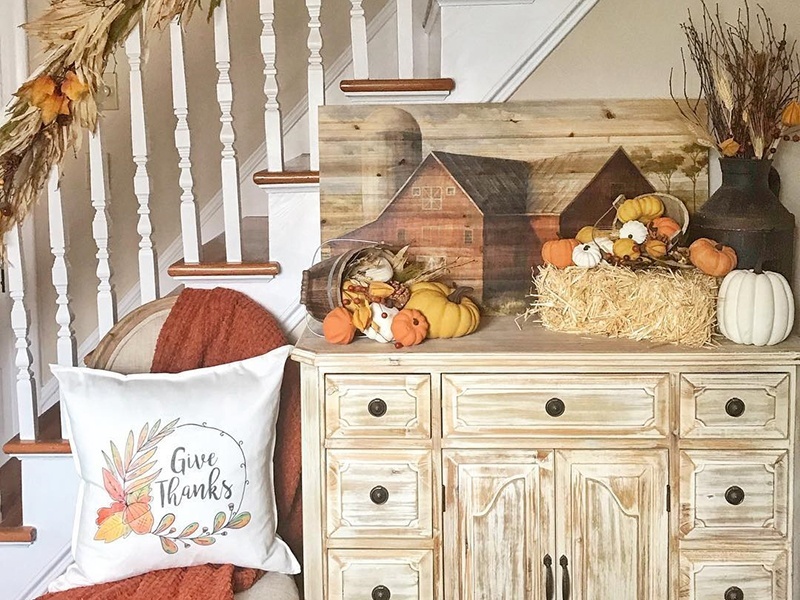 It features a metal round table with a wooden top, a pot of fresh yellow flowers, a bale of hay, a lantern with pinecones, a tray of miniature pumpkins, a cute little pumpkin sign, a single pumpkin, and a friendly wooden scarecrow. To celebrate the Fall harvest, add this barrel full of flowers to your fairy garden. It comes with a delightful mix of Fall colored-flowers, as well as a tiny hay bale topped off with a perfect little pumpkin. Truly whimsical! Here's another miniature wreath that you can hang on a miniature fairy house. It measures a little less than two inches and features a bountiful arrangement of faux wheat, flowers, and berries in all the vibrant colors of the season, delicately placed on top of a bed of moss. Add a homey feeling to your fairy garden's fairy house with this rustic pitcher that serves as a vase to some charming flowers. It is placed o a decorated board with three pumpkins, perfect for the Fall season. The harvest season requires hard work with the help of some wheelbarrows. 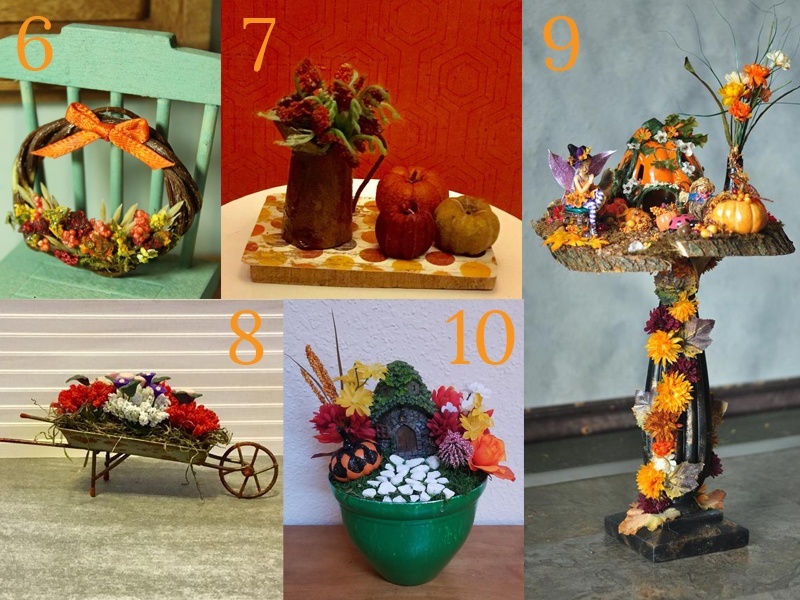 But at the end of the harvest, fairies love to decorate their wheelbarrows with some gorgeous Fall flowers. This rustic little wheelbarrow has a weathered look to it that goes very well with the florals in it. Adorned with lots of flowers in the colors of Fall, this fairy garden is perfect for Halloween. It includes the fairy garden standing on a 16-inch decorated pedestal, a 5.5-inch pumpkin house, and an authentic log platform that measures 13 inches. This Autumn fairy garden is decorated with lovely flowers in red, orange, and yellow. At the center of it all is a quaint little fairy house where fairies can rest for the night. It also include a nice white stone pathway and a pumpkin! Don't go just yet, we have more amazing Fall home ideas below. Bask in the colors of fall along with your fairy friends with these floral fairy garden ideas and make sure to bookmark Teelie's Fairy Garden for more!